They have a savage strike and they’re a hoot on the line, pirouetting this way and that through the water as they try to throw the hook. They’re abundant, often found in schools, and they’re relatively easy to catch. Plus, they make for good eating out of the smoker. And they’re so far off the radar of most anglers that you can practically have this great gamefish all to yourself. Meet the goldeye (above), a small but very sporting fish found throughout much of Alberta, Saskatchewan and Manitoba. They be can caught on both spinning tackle and fly gear, and with the annual spawning run about to begin, there’s no better time for anglers to get in on the goldeye bonanza. Fish the muddy backwaters of rivermouths, deep pools in riverbends, and, in late spring, near the mouths of tributaries to large rivers (below). In lakes, goldeye seek out turbid shallows. 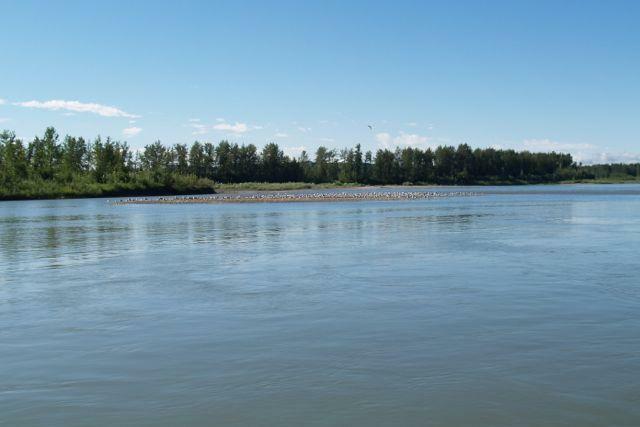 In Alberta, popular rivers for goldeye fishing include the Oldman, South Saskatchewan, Red Deer, Bow, North Saskatchewan, Peace and Athabasca, some of which flow right through major urban centres. In Manitoba, popular rivers include the Assiniboine, Red, Saskatchewan and Winnipeg. And in Saskatchewan, the top locations are the South and North Saskatchewan Rivers. If you’re not sure where to start fishing for goldeye in your province, a good bet is always near the mouth of a tributary to a large river (above) . If you know where there’s a good spring walleye run, it’s highly likely goldeye will also be in the same general area. Goldeye overwinter in deeper water and move into the shallows once the ice breaks up in the spring. May and June are the best months to fish for them, as that’s when they begin their annual spawning run. Upstream movements seem to be triggered by a rise in water temperature, usually once it reaches 10 to 12°C. After goldeye spawn, their semi-buoyant eggs float downstream, often for long distances, and hatch after a couple of weeks. While there are anecdotal reports that goldeye feed mainly at night, they can be readily caught during the day throughout the open-water season. Goldeye eat all manner of aquatic insects, small fish and terrestrial invertebrates that fall into the water. They’ll even take earthworms. Translation? 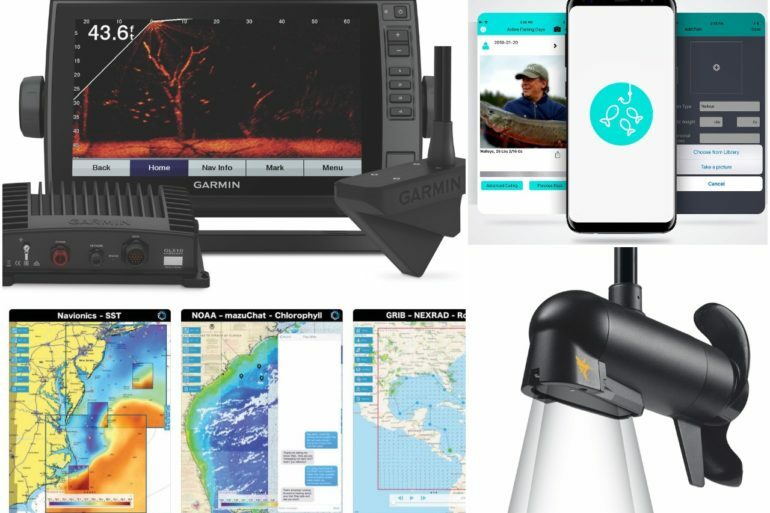 Anglers have plenty of options. 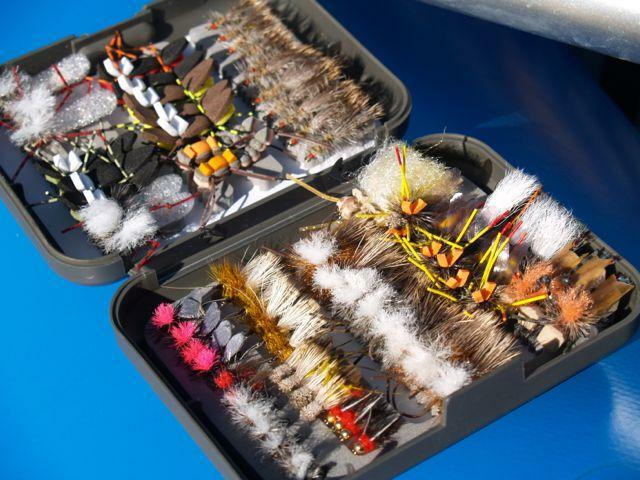 The trick is to keep your fly, lure or bait near the surface, where goldeye feed. Spin anglers should opt for an ultralight spinning rod and reel, with four- to six-pound-test monofilament. Mepps Aglia (below) and Panther Martin spinners are both good bets, owing to their action and visibility in turbid water. You can also use a spinning rod to present a fly. Tie one end of a torpedo float—clear plastic works best—to your main line, and the other end to a 10-foot, four- to six-pound mono leader. Now attach a choice fly to the end of the leader and let it rip. You can use this rig to fish dry flies, streamers and nymphs, varying your presentation techniques as though you were using a fly rod—in some cases you’ll have as much or more success. Also, you’ll generally have a much longer casting distance. If you’re a worm dunker, no worries, you’re still in good shape. Simply use a plastic bobber, with a short leader and bait hook. The key to this presentation is to set the bobber so the worm is no more than one foot from the surface. Goldeye are regarded as a perfect fly angler’s fish because they’ll take dry flies, wet flies, streamers and nymphs. At times, they can be so easy to catch it’s almost embarrassing. A 4-weight, nine-foot rod rigged with a small-arbour reel, matching weight-forward floating line, and a nine-foot tapered leader is ideal. When you’re fishing a large river, think strategically and break down the water into imaginary grids. Focus on the most promising holding water, such as the head or tailout of a pool, along seams and foam lines, and near boulder gardens. Cast strategically—don’t just make the money shots and ignore other decent holding water. Remember the tried-and-true saying: “Foam is home.” Often, all manner of fish will be in lairs beneath foam lines and pockets of foam, which offer shelter from avian predators. If you see rises, sight-cast accordingly. Generally, though, you’ll likely have to start with attractor patterns (above) to find where the goldeye are lurking. One go-to attractor pattern is the Chernobyl Ant. For best results, use one with a light coloured bottom. Cast across and let it float in a dead drift. If you don’t get any action, try skating the ant across the water, twitching it as you strip in line during your retrieve. Should you get a rise, mark the spot and focus on it. Once the action drops off, though, take a few steps upstream and cover the next grid you’ve mapped out in your mind. When the bite is hot, you’ll catch a lot of goldeye with black, brown or olive Halfback and Fullback Nymphs, which imitate stoneflies. Fish them in a dead drift, then strip in during your retrieve. Because goldeye are piscivorous, they’ll also devour streamers, such as earth-coloured Woolly Buggers. You don’t need a sink tip when fishing steamers for goldeye. Instead, a floating line is key because the fish will be near the surface or in mid-stream water—just lying in wait for your fly to arrive. 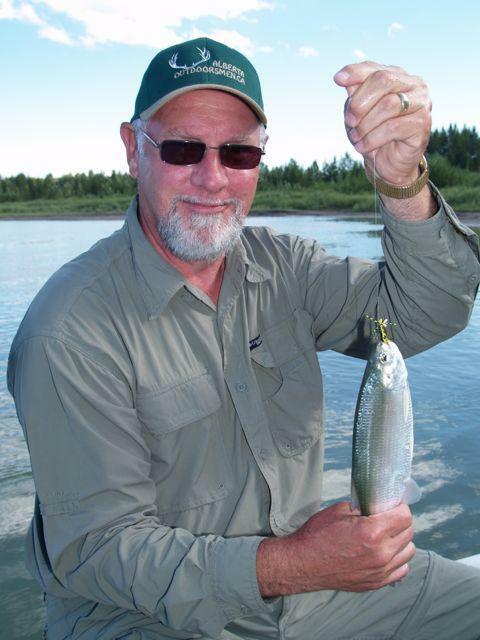 Duane Radford first fished for goldeye on Alberta’s Mikkwa river in 1968. Other common names for goldeye include Winnipeg goldeye, western goldeye, yellow herring, toothed herring, shad mooneye and weepicheesis. The French common name is laquaiche aux yeux d’or. 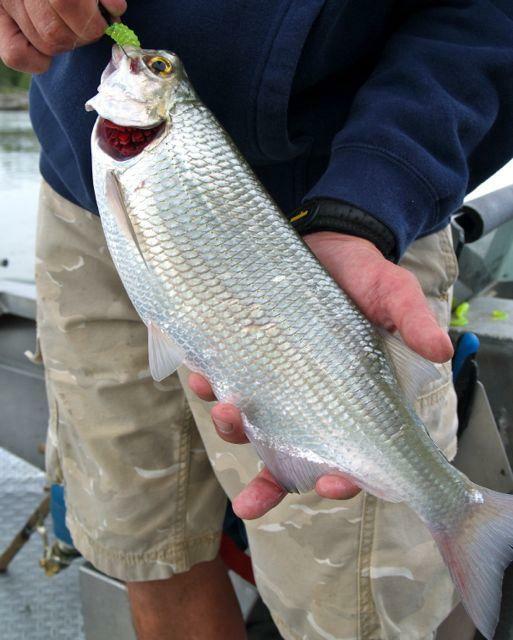 Close in appearance to shad, goldeye are 13 inches long on average, but can grow up to 20. They typically weigh roughly two pounds, although four-pounders have been caught. The goldeye is one of two members of the Hiodontidae family of fishes, the other being the similar-looking mooneye (above). The two fish are difficult to tell apart at first glance; aside from the dorsal fin sitting farther forward on the mooneye, both fish have laterally compressed, silver bodies and large scales. The best way to differentiate between them is by their eyes. Goldeye have large yellow eyes, while the top half of the mooneye’s iris is gold and the bottom half is silver—hence the name. 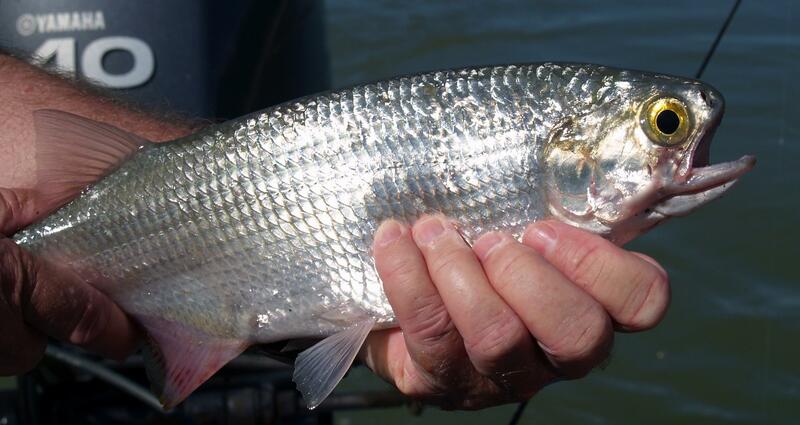 Mooneye are also smaller, reaching a maximum length of 12 inches and a top weight of just over a pound. Goldeye are fairly abundant throughout their overall range, while mooneye are less so. Plus, the mooneye’s western range ends along the eastern edge of Saskatchewan.